The seasons matter to cycling. And cycling makes the seasons matter. In the north-west of England we’ve finally emerged from the harshest Winter. The days are growing longer and warmer. The deep cold has gone and life is returning to the land. Struck by a cold, I was off the bike for a week but, with my strength coming back, each of the past few days I’ve ridden out of town for a short, gentle ride towards the end of day. 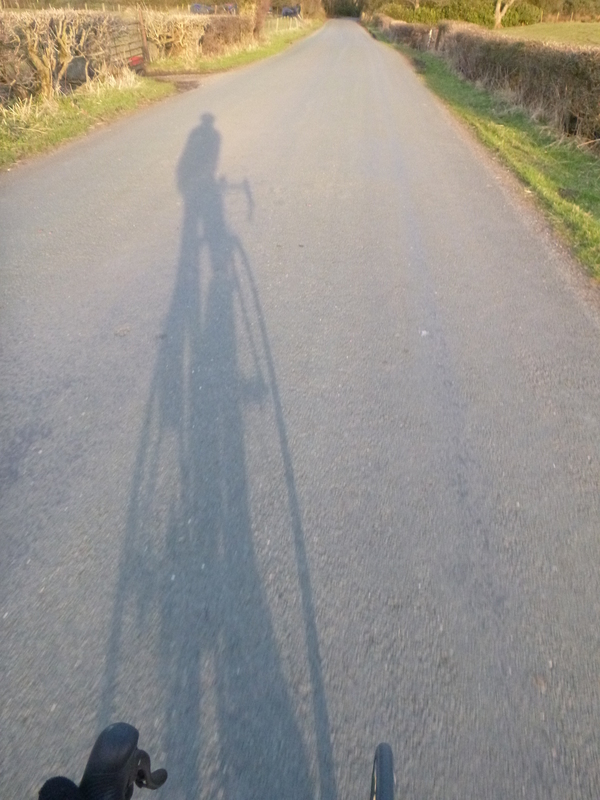 It’s a lovely way to spend an evening, enjoying the quiet lanes and lengthening shadows as the sun falls over Morecambe Bay. 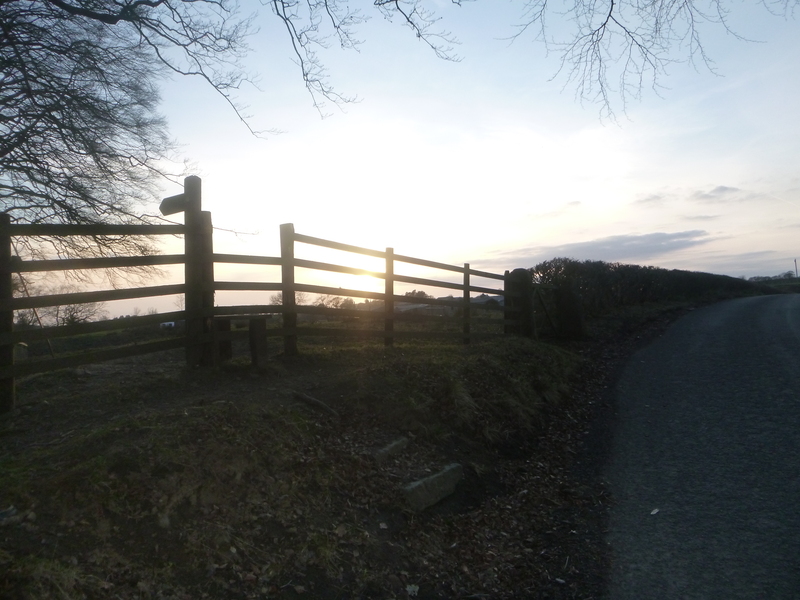 Last night I left the house at 7:30 to do a little loop into the Forest of Bowland and up to Jubilee Tower. 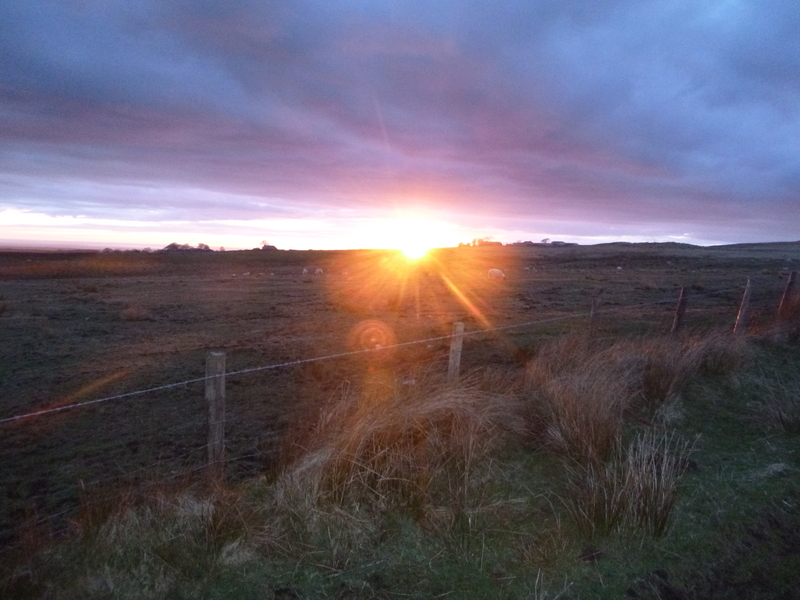 Lambs bounced round the fields, hares sprinted off at my approach, and birds busily prepared themselves for the coming night. 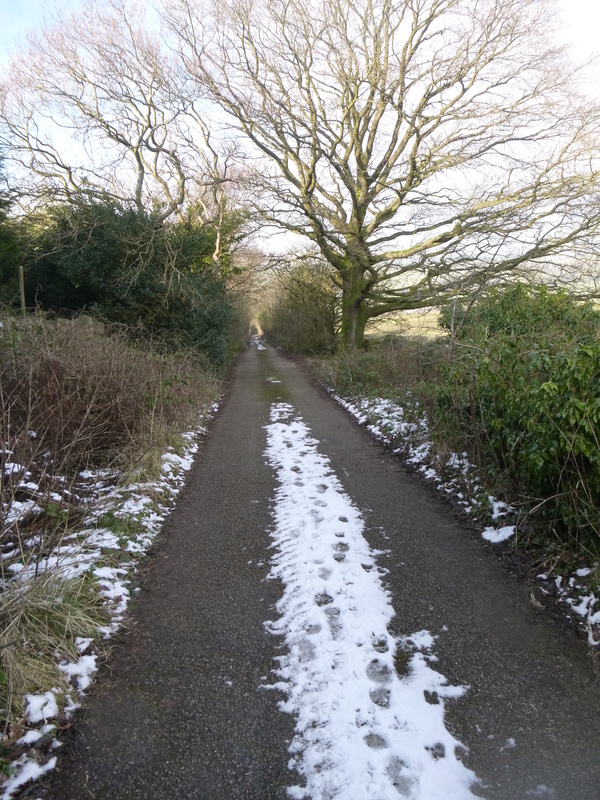 Occasionally a farmer’s tractor or quad-bike trundled somewhere in the distance, but the lanes were empty of cars. I love the feeling of having all this countryside, all this space, virtually to myself; I sink into it, become blurred, am content. I hurtled back down to the quiet Sunday night city, passing the Town Hall clock as it chimed a-quarter-to-nine, some light left still in the sky. For the next two months each evening will grow a little longer, and hopefully warmer too. Isn’t this the very best time to be on a bike, the longest days and best weather still ahead? Our bodies turn with our pedals towards the optimism Spring surely brings. Winter’s cold and dark tempts the closing of curtains and indoor retreat. Spring seduces us back to the world outside. The scope for cycling becomes so much greater. The traditional pro-cycling calendar reflects this – we’ve had the early season Classics and can now anticipate the Summer’s Grand Tours. Locally too Winter’s dormancy has retreated and the cycle racing season begun, the weeks now crowded with events. 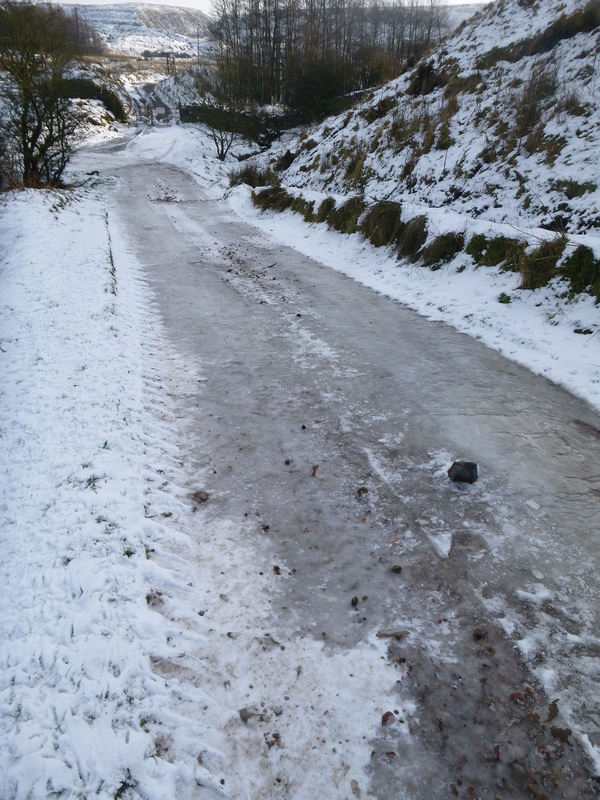 Winter cycling is great, but includes a certain amount of ‘getting through’. 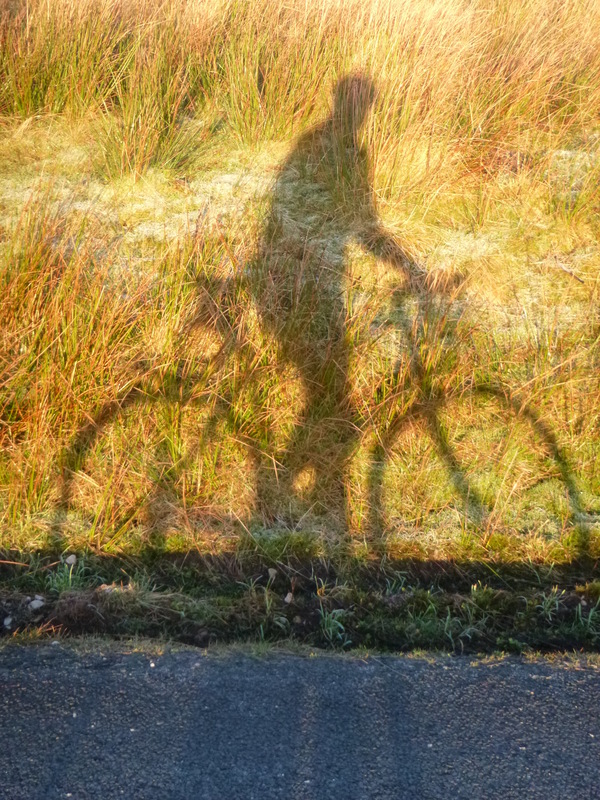 Winter cycling matters, but there always lurks an orientation to brighter, better days ahead. Many people cycle only once it gets warmer, but surely no one cycles just in Winter. We know how seasonal cycling is, how warm weather triggers the inclination to cycle. The bike shops get busy, new people on new or refurbished bikes are out and about. Of course we need to create conditions which compel people to cycle all year round, but in the absence of bolder, broader institutional support for ordinary cycling it’s understandable that most people’s interest in riding changes with the weather. We’re ‘a cycling family’, but cycling is seasonal for us too. On Saturday morning I went with Bobby and Flo to our brilliant local children’s cycling club, Salt Ayre Cog Set, where weekly sessions have resumed. Both complained bitterly at being made to go; I was ‘the baddie’ breaking their winter hibernations in which lazy stasis inspired by staring at screens has taken centre-stage. But the sunshine, sociability, fresh air and exercise boosted their energies, and they came away bubbling with enthusiasm, as though participating had sprung Spring within their little souls. Springtime cycling is a mechanism for lifting our spirits and horizons, taking us to other, farther, more interesting places. Of course for those of us who ride year round Spring feels good partly because of the Winter that came before, as well as the Summer that lies ahead. Contrasts are everything: even the places through which we most regularly ride change dramatically; and as the temperatures rise and the days lengthen cycling becomes less shackled by some Winter essentials: lights, layers, gloves and hats; things can gradually be discarded. There’s a ‘freeing-up’ both of cycling and our selves. My little ride last night wasn’t cold, but we’ve yet to experience a truly warm evening this year. At long last, though, it’s feeling possible; the dreamy, delicious prospect of the after-dinner short-sleeve and shorts ride through warm and windless air has moved one step closer. 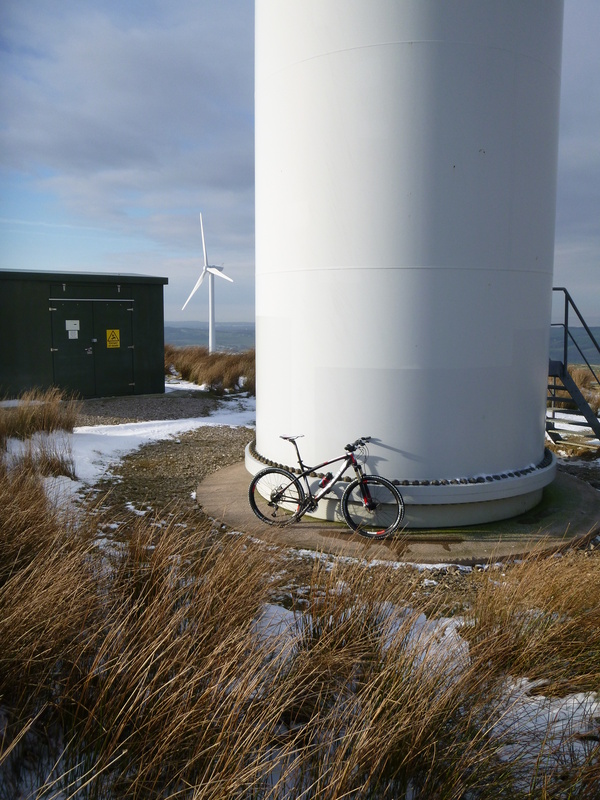 Wind farms and bicycles – two technologies appropriate to a sane, sustainable future. But more than that, they’re symbolic of that future; there are surely no objects better symbolising the age towards which we’re moving, too slowly, but surely. For me the aesthetics of technology is ethical. I love wind turbines like I love bicycles because they’re good, pointing in the right direction. Of course I know both bicycles and wind farms are hugely, strangely controversial. They’re sometimes ridiculed, but it feels like both are gradually becoming accepted as necessary. And though not nearly enough, both are proliferating – wind turbines off our coasts and over our hills, and bicycles … well, where exactly? A Parliamentary Inquiry is currently investigating how to get Britain cycling. Pay attention to our London-centric media and you’d be forgiven for thinking we’re on the brink of ‘a cycling revolution’. Use of the bicycle is probably rising across some towns and cities, yet so slowly it’s barely a trickle. My own hunch is that bicycles are proliferating most in people’s imaginations and aspirations. For many Brits their status has upped a notch, and the idea of cycling is less outlandish than it was a year or so ago. And cycling has moved a tiny bit further towards the centre of our collective cultural ideals of good lives and good cities. There’s a zeitgeist to convert, and we’re waiting for politicians to convert it, because the main changes necessary to get Britain cycling must be made at national level with huge reallocation of resources away from the car and towards the bicycle. It’s because I love cycling that I’m involved in debates about cycling’s future, but it’s because I love riding that I’ve some immunity from the emotional roller coaster that involvement in those debates can bring. Sure, I’d like everyone to have cycling in their lives, but at least in the meantime I can enjoy having it in mine. But I’ve still no road bike. It’s still cold and icy. My world has shrunk. I’m feeling hemmed in. 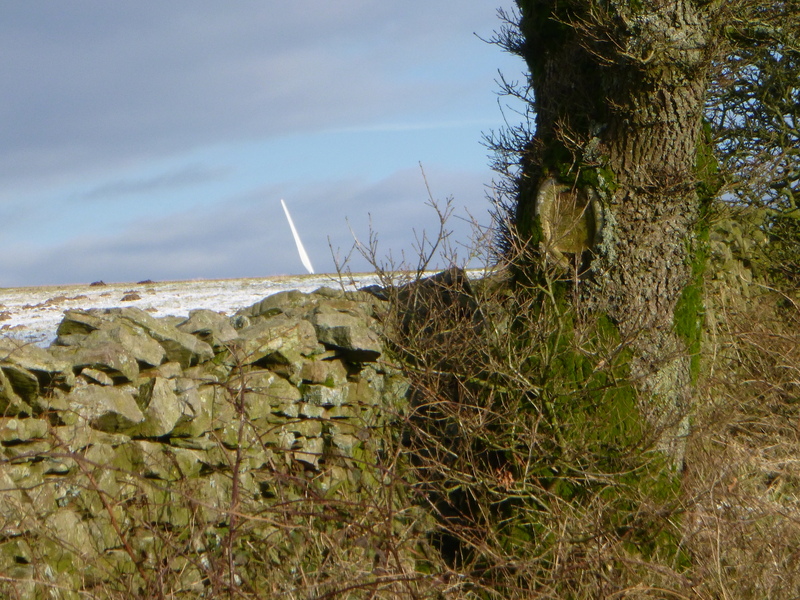 Parts of north Lancashire and Cumbria close to the coast are clear of snow, but the world a short way inland remains white. Unable to go farther afield, today I jumped on my mountain bike to explore little known places close to home. I’ve lived and cycled here 15 years, but there remain roads and tracks within ten miles I’ve rarely been. 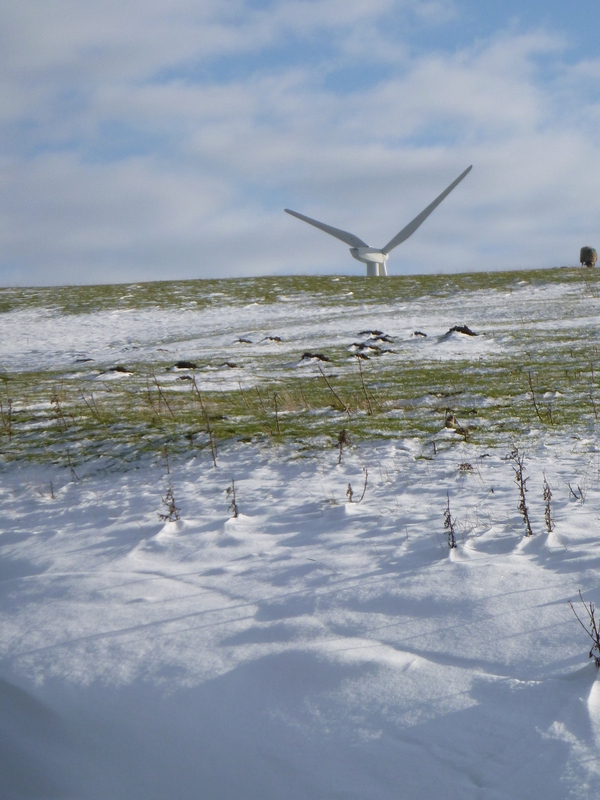 Ahead the wind turbines’ slowly rotating blades strike brilliant white in the low winter sun. Their slim white lines have the elegance of the egrets we sometimes see at Leighton Moss, a short way north on Morecambe Bay. Depending on my position the turbines seem sometimes close, at others distant. Sometimes they take me by surprise, their blades appearing suddenly above, disturbing the point at which land and sky meet. I love riding this compact, complex topography. To reach the wind farm I drop down almost to Brookhouse before climbing up again on a lane I’ve not taken in years. 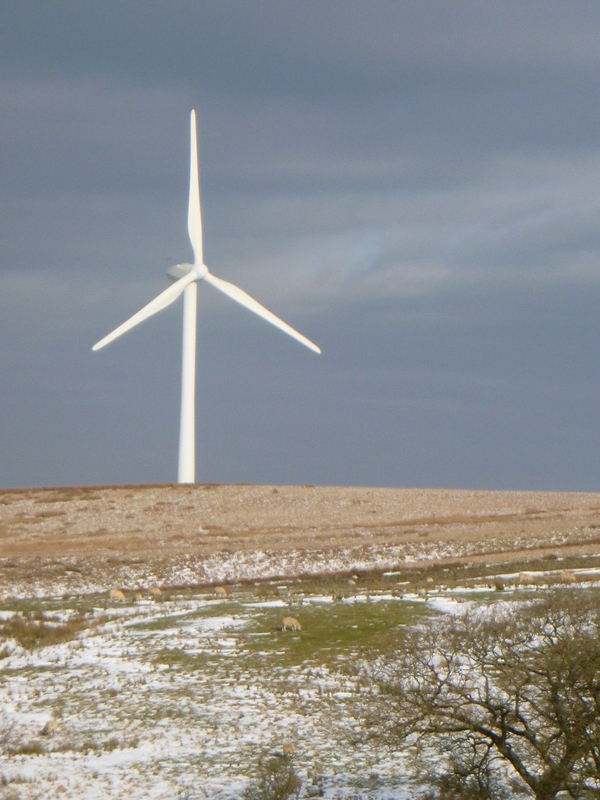 It rises steadily to Caton Moor, the wind farm all the while drawing closer. Up here the drifted snow is deep in places. 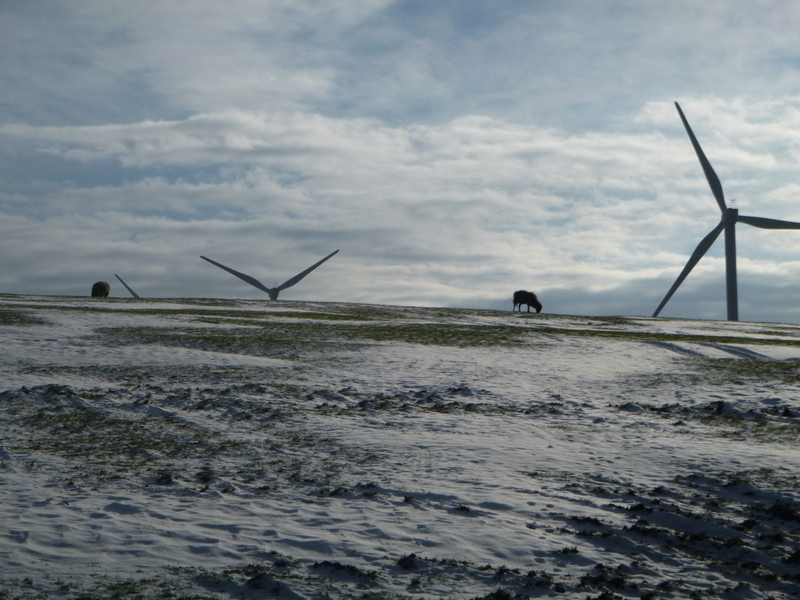 This was one of the UK’s first commercial wind farms. 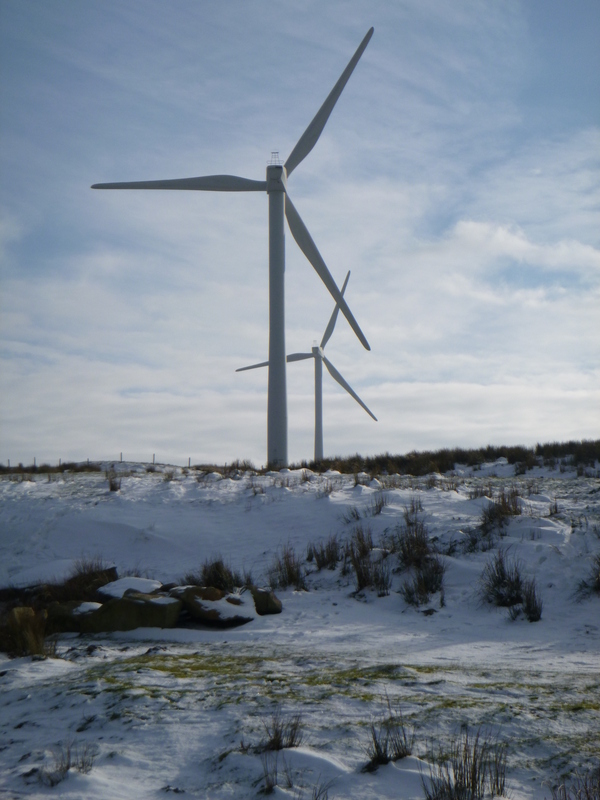 When it came into service back in 1994 it produced 11% of the UK’s total wind energy. Wind technologies have developed fast, and in 2005 its original ten turbines were replaced with the current eight. 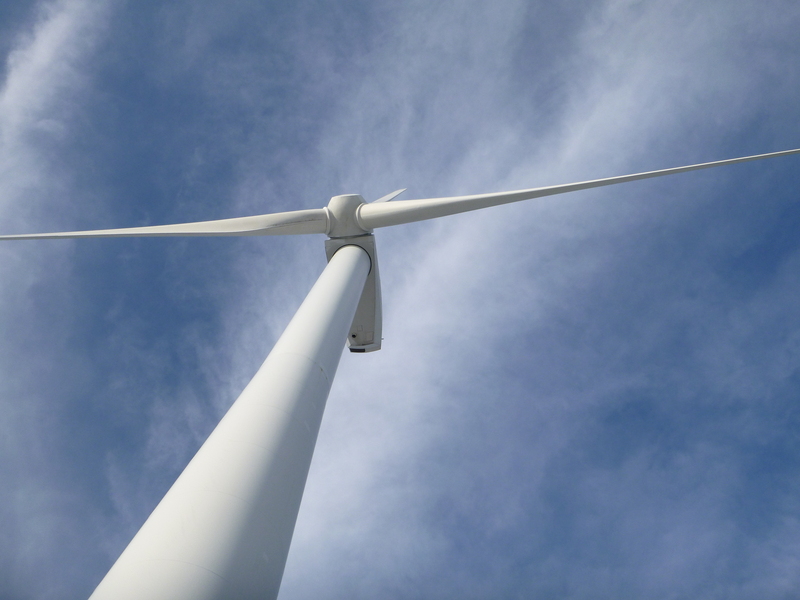 Their combined capacity is 16 MW, enough energy to power 10,000 homes. I ride reverentially between the white giants standing in the snow. They’re so high (55 metres) they make me and my bike feel puny. Standing next to one I turn my head to see its blades (35 metres long) tumbling one at a time down from the sky toward me. It’s like staring into the heights of a great cathedral, but better. I feel giddy, overawed. Cyclists know the wind’s power. We feel its pull and push. When it lends a hand the world seems easier. When it’s in our faces we hunker down and push harder. We know its noise too – the way it roars, at times so loud it’s hard to hear the words of the person riding beside you. Where would cycling be without wind? A bridleway follows Kirkby Gill off the moor down to the Lune. Where it’s not covered with ice its surface is full of brick. I drop out of the snow and under the aerial ropeway which until recently took clay from the pits above to Claughton brickworks below. Just before Claughton a little track goes east through Farleton where I join the main road. 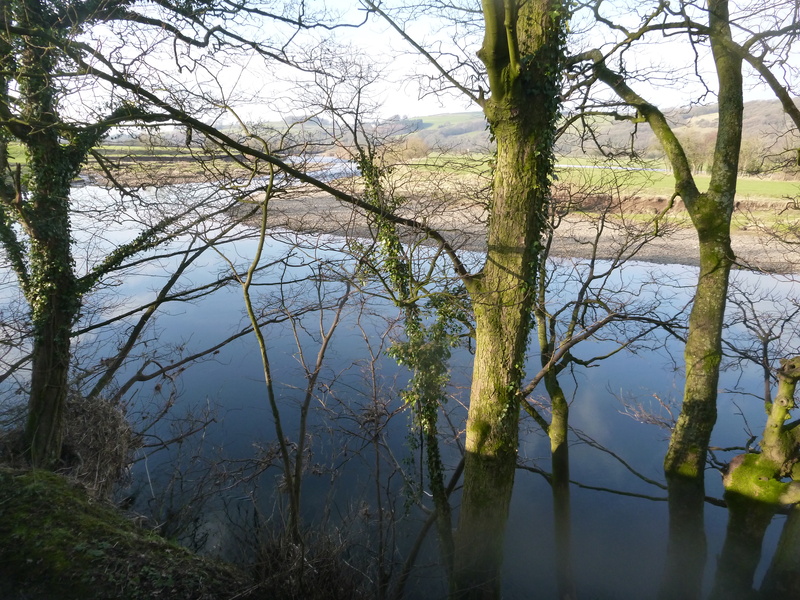 I follow the Lune downstream to home. I’m glad to have been forced into this little ride, but I’m a coiled spring waiting for my road bike and milder weather to return so my corner of the cycling world can open up again. It’s snowing now, as I write, but a thaw is on the way. Winter riding’s full of pleasures. For me one of the greatest is the proximity of daybreak. Far more easily than in other seasons, you can leave the house in darkness, ride into and through the dawn, and out its other side. It’s just another ride, but also an adventure. I know it’s probably not for everyone, but nonetheless it’s an experience I highly recommend. This morning I left the house before seven. This early I like to ride through the still sleeping city centre. It’s almost empty of people, and those around don’t seem to mind the solitary cyclist. Lancaster rises quickly and steeply to the east. The climbing starts at the Town Hall on Dalton Square. Going this way makes a hard start to a ride; sometimes it feels too hard, but it’s somehow more inviting when the streets are quiet, dark and cold; taking this road, spinning a low gear, warms you up nicely. I start climbing to the sound of people scraping ice from car windscreens. It’s turned decidedly cold the last few days. A few minutes later I’m out of town, passing under the M6, already busy with traffic. This time of day in this part of the world most people are travelling north/south; few are going my way. The air’s so still the motorway’s noise stays with me for a long time as I climb higher. 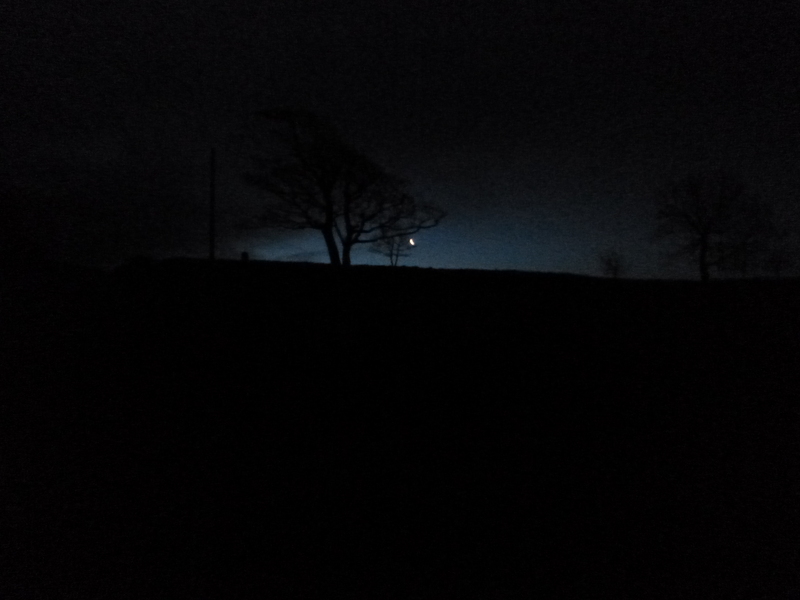 The road undulates its way south-east, the crescent moon bobbing on my horizon to the south as I go. The road drops steeply down Quernmore Valley. At the bottom the climb to Jubilee Tower begins. From Quernmore crossroads the road really ramps up, leaving the village and valley behind, set almost straight for the moors. Just five miles from the city’s centre at the Tower I’m already 300 metres high. 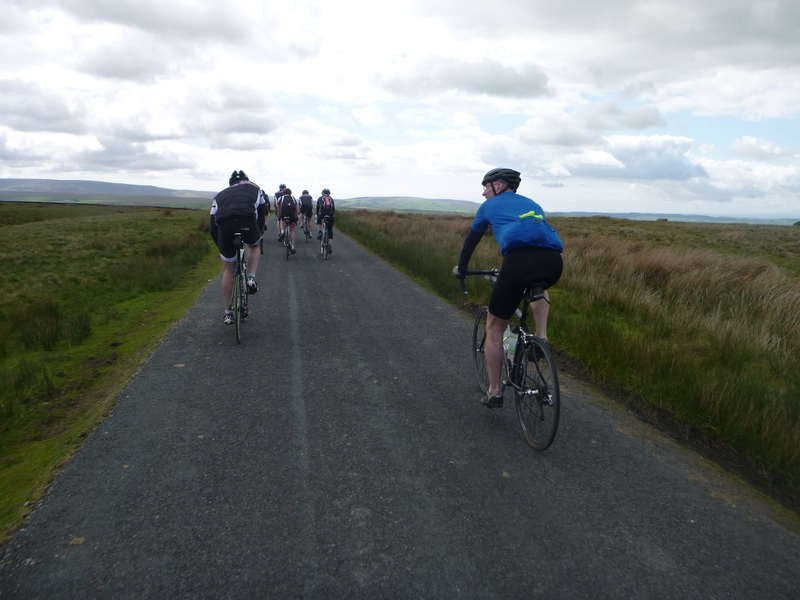 East through the Trough of Bowland. 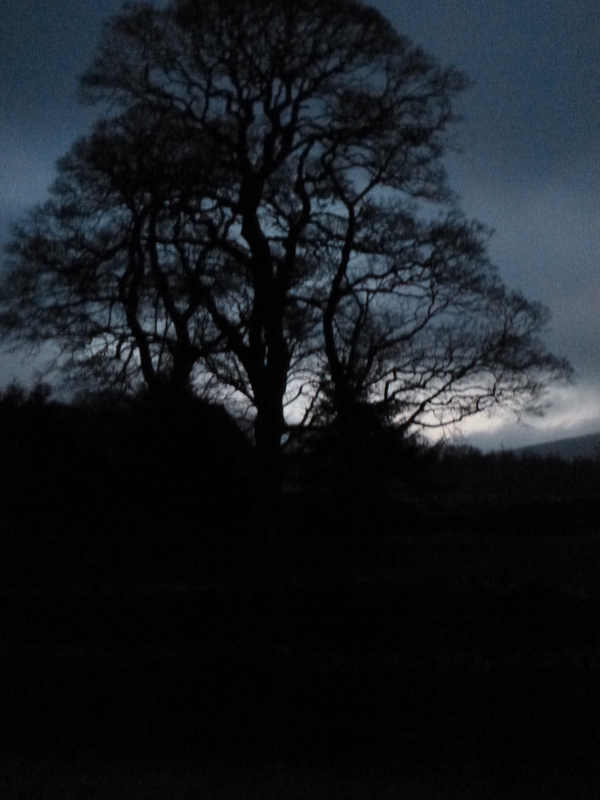 The trees began as shadows in the dark but are gradually becoming more deeply etched against the steadily lightening sky. By Dunsop Bridge I no longer need my lamp to light the road ahead. Gulls swirl and starlings swarm above the fields of the Hodder Valley. 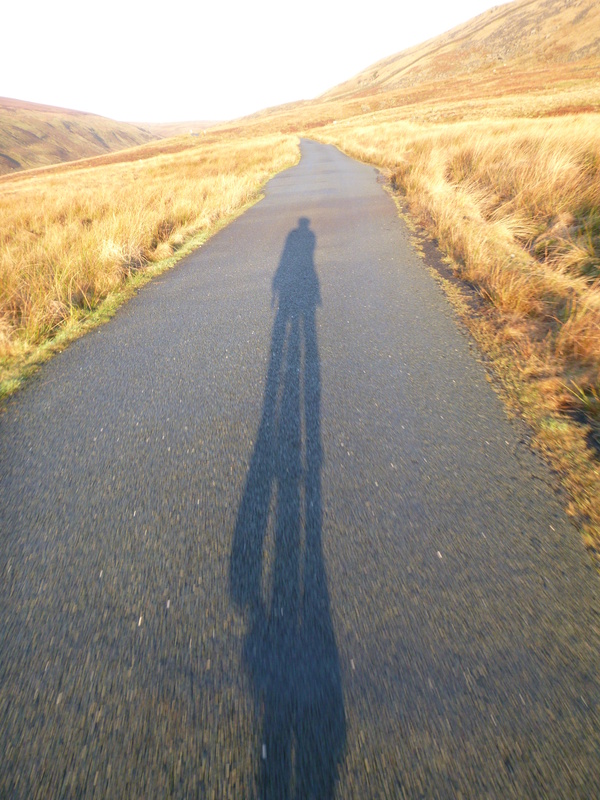 By Slaidburn, twenty miles into my ride, the sky is clear, the sun has finally crept above the horizon, and the day feels properly broken. Of course it’s still early on a mid-winter’s day but the contrast with my departure in darkness an hour and a half earlier makes me feel I’ve reached a place of comfort and ease. Sunshine makes the riding easier. Getting close to trees is the biggest winter cycling pleasure for me. I love to see their shapes, skeletons, limbs unclothed by leaves. A de-cluttering of the landscape under the dark and cold renders their naked forms majestic. They stand strong and proud. I find them impossible to ignore; though other things inevitably get in the way I fix my gaze on one, then – as I move past – find another, solo winter riding a joyful procession between magnificent trees, standing sentinel over the sleeping land. At Slaidburn there’s ice on the Croasdale Brook Bridge, and my tyres slip twice as I start the climb to the Cross. 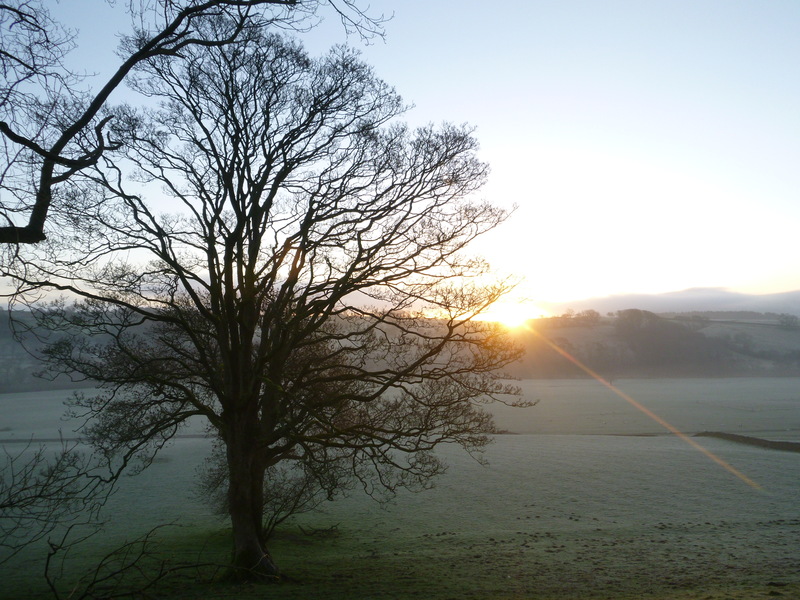 The low January sun at my back lends a golden hue to Bowland’s fells. 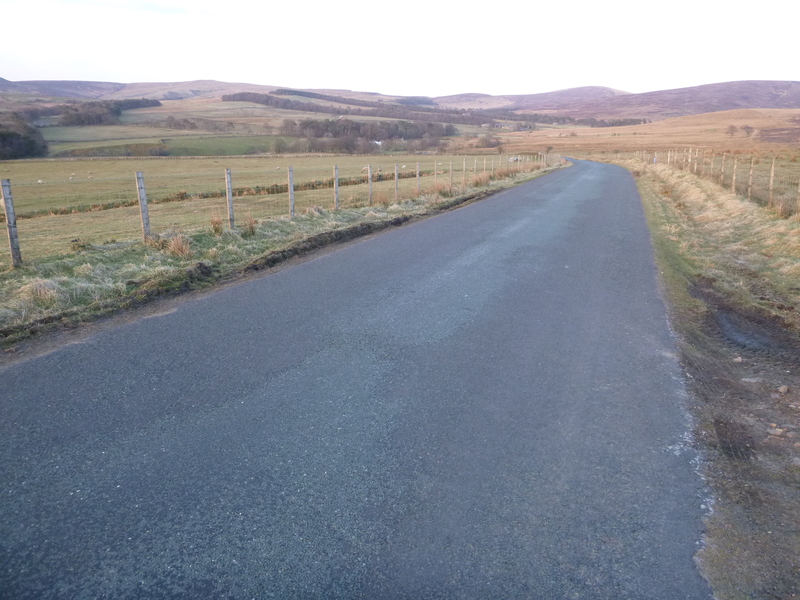 With the sunshine, lack of wind, and my body warming with the climb, it’s stopped feeling like a mid-winter’s ride. Over 400 metres up at the Cross o’Greet I’m well above the fog now filling the valleys whichever way I look. The top of Ingleborough away to the north looks for all the world like an island of its own. I drop down towards Bentham, then turn west along Mewith Lane towards Wray. The fog thickens and the temperature drops. 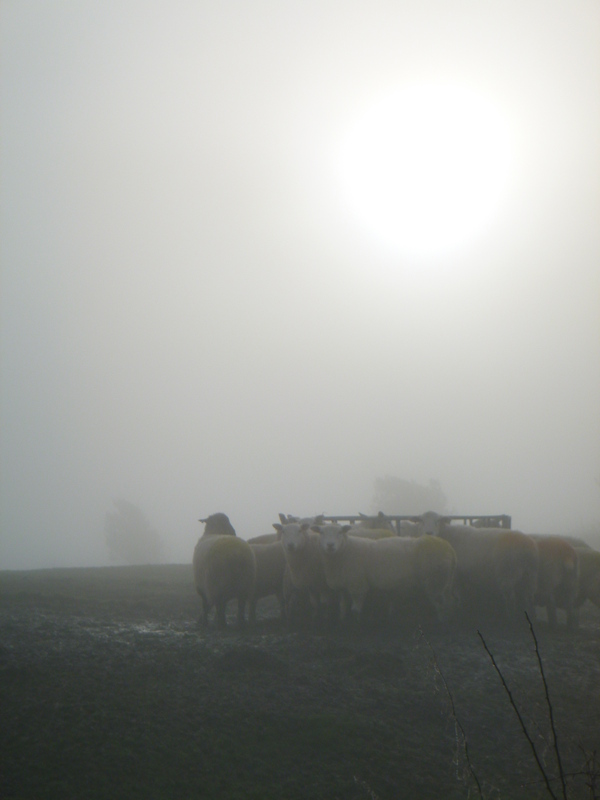 By closing off my wider view, the fog forces awareness and appreciation of the immediate. The broader environment out of the way, I feel more intimately placed as I pass. I’m the moving centre of a clear pocket of air with perhaps a twenty metre radius. Moisture drips as I pass below the trees lining the River Hindburn which I follow into Wray; as the fog’s thickened they’ve become ghosts. It’s so still I hear approaching vehicles, but hope their drivers see my penetrating lights long before me. It could feel claustrophobic were it not to feel so eerily beautiful and special. Over the Hindburn before Wray and the Wenning before Hornby. There I turn north to cross the Lune at the only point possible between Halton six miles to the south and Kirkby Lonsdale eight miles to the north. The fog holds its height and I drop in and out of it as I cross the folds and furls of the Lune’s north side. By the turn off to Aughton I know it’s downhill or flat almost all the way home and I back off slightly, starting quietly to savour the gentle satisfaction of another ride almost done. Back in fog-bound Lancaster, I can hardly believe only a few hours ago I set off in darkness, to ride through and out of the breaking day and into glorious sunshine. Like most rides my memory of this one will quickly dim. Nevertheless they accumulate, these rides, eh? I made a blunder on the domestic front when I agreed to the dates for the Building Cycling Cultures event, which took place in Leicester at the weekend (I’ll write about it later this week): I had to disappear down south on Saturday, Bobby’s 10th birthday, and completely missed our local sportive, run by our cycling club (Lancaster CC), which took place on Sunday. 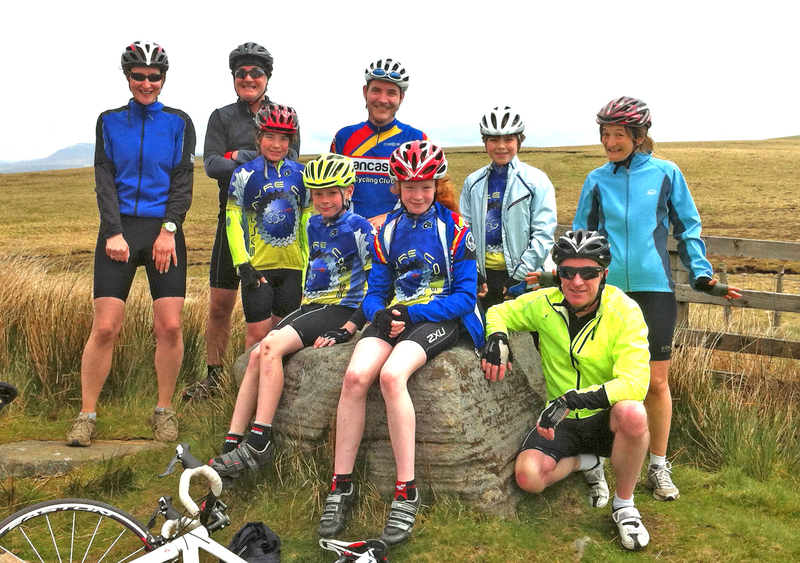 But with me down south, Sue and Bobby decided they’d try the 43 mile route anyway, especially when Bobby’s classmate Ffion and her Dad Rick also opted to give it a go. Sue’s written a short report of the day, which I’ve copied below. This is the lyric which Rick kept singing as we began the Le Terrier short route on Sunday. A bit annoying, but he had a point. There’s nowt bonkers about going on a 45 mile bike ride, even if it is a bit cold and rainy, but taking two children with us? It felt a potentially daft thing to do. 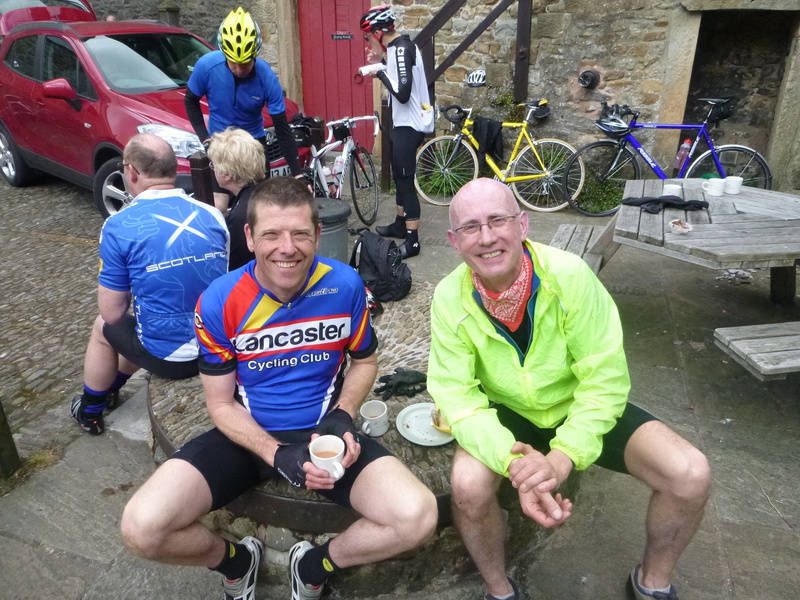 It’s true that Bobby (ten years and one day old) had cycled to Slaidburn last year, but he then stayed the night before coming back to Lancaster. 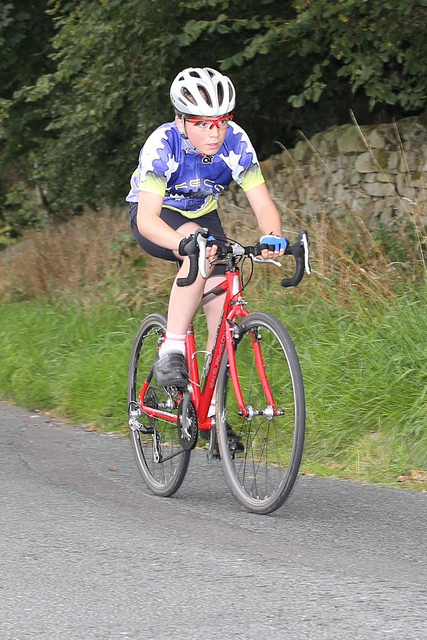 Meanwhile his classmate Ffion (who’s just still 9) has been riding a 6 mile time trial regularly, but had never ridden up a steep hill. Could they do it, could they enjoy it, or might we have a moanfest of a day, have to call for a motorised rescue, and put them off cycling for ever? The first hill, Jubilee Tower, is a bit of a workout – indeed, a climb I used to be scared of. The kids hit their bottom gears, danced on their pedals, but then Ffion got off and walked. I think she had exhausted herself by being undergeared! She also felt sick from the sight of so much fresh road kill … all those baby rabbits hoppity hopping to their deaths. Luckily she listened to her dad’s advice, and soon learned how to climb without needing to stop, and to look away from the tarmac carnage. As we continued to the Trough of Bowland the rain got harder, so at Dunsop Bridge we treated our cold toes and fingers to the warmth of the café. Bobby and Ffion could probably have made their hot chocolates and flapjacks last until tea time, but we eventually got them back out into the rain with the promise of more treats at the Slaidburn stop. There the small kitchen was bustling with friendly cyclists in thin or non-existent rain coats having the same conversation: “this wasn’t forecast” and “I’ve not come prepared for this weather!” We indulged in the feast of unlimited sandwiches, malt loaf, cake, flapjacks and (most excitingly for the children) crisps and jelly babies. Perhaps it was the quantity of food he’d just eaten which led Bob to have an emotional wobble on a climb soon after: “I’m not doing this next year”, “I’m going to be sick!” and “I can’t do it”. Or perhaps it was my honest reply to his question “are we half way there yet?” We weren’t, quite, but he recovered. The clouds cleared and the climb up to the Cross o’Greet was glorious. Cruising down from the Cross was fabulous. Bob was absolutely beaming with the thrill and exhilaration of it, and asked if we could ride back up to do it again. Request denied. On we went, with Rick delighted to discover such beautiful lanes to ride on, after living in Lancaster for more than 20 years. Faster riders kept speeding past us, but we rolled on and down to Wray, and then hunkered down to the busier roads which complete the short course. 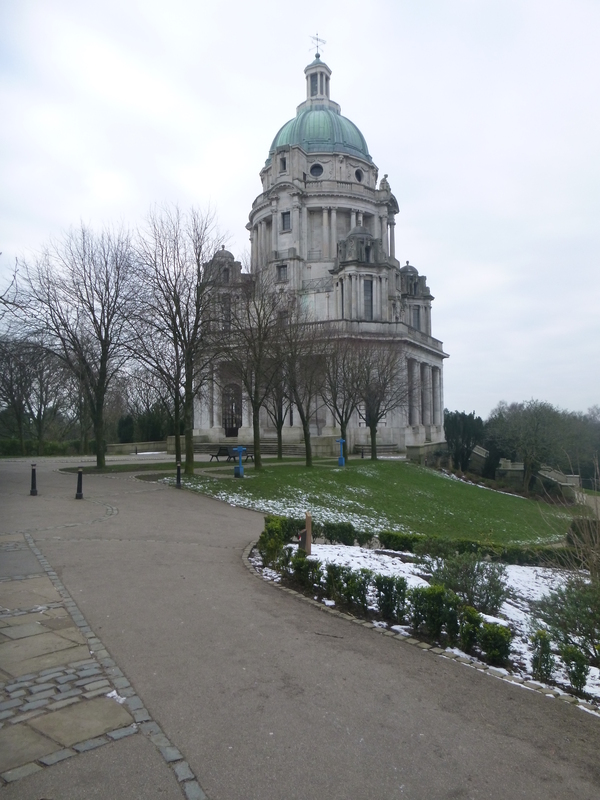 As he had promised in the morning, Bob sprinted off as soon as we entered Williamson’s Park, closely followed by Ffion. Congratulations Bobby and Ffion – you’re both super stars! And well done Sue and Rick – if you like, you two can do the big one next year and the kids can coax me around one of the shorter options! And big thanks to the many people involved in making the event such a great success – I promise not to miss 2012’s Le Terrier! What would we do were not the countryside dotted with welcoming places of food and drink? For the cyclist, the cafe’s a crucial resource, it enables us to ride, it makes our rides. The cafe has today become for many people – people who arrive by car – a destination, a place to which they travel in order to go there. This isn’t so for the cyclist, who goes to a cafe in order to go for a ride; for the cyclist the cafe is a resource, not a destination. And doesn’t that make the cafe so much better! The cafe matters so much more to us. At this time of year, building the miles and my legs, I wouldn’t make some of the rides I make were it not for the cafe. 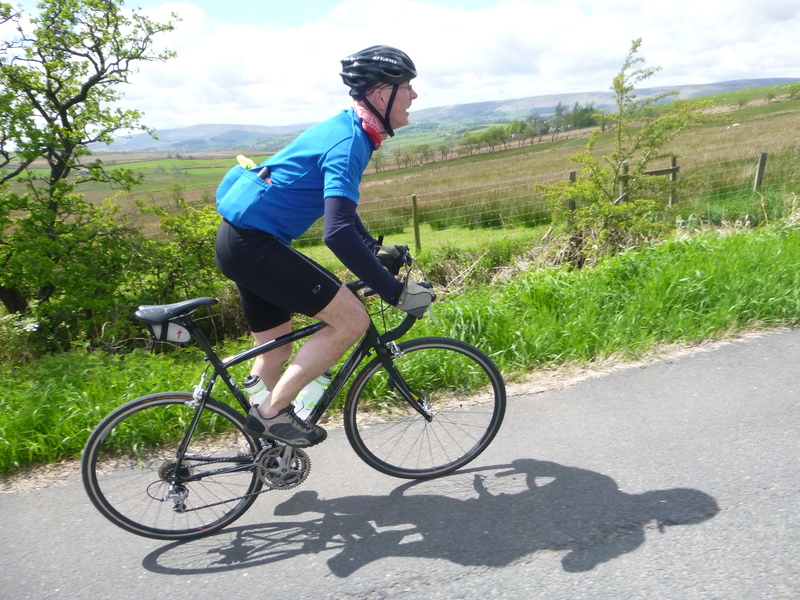 Yesterday, for example, I set out from Lancaster, over Jubilee Tower and through the Trough of Bowland. At Dunsop Bridge I knew a decision had to be made – either turn right to struggle into the wind to Chipping and then fly north to home, or else a longer, harder route – left with the wind to Slaidburn, up over Bowland Knotts towards Clapham, and finish with a 15 mile push west into the still strengthening wind. I took the harder option, thanks to the cafe. A few months from now, when I hope I’m fitter, stronger and leaner, I’ll not depend on them in quite the same way, though still they’ll have their uses. But for now, the cafe acts as both insurance and hospice. Confidence in making my rides gradually longer and harder comes from knowing there are cafes en route. I might not use them, but should I want to or need to, they’ll be there. The cafe also breaks up these pre-season rides into more manageable chunks. My mileage dropped dramatically in the tail-end of last year, the snow and ice meaning I did no long rides at all through December. 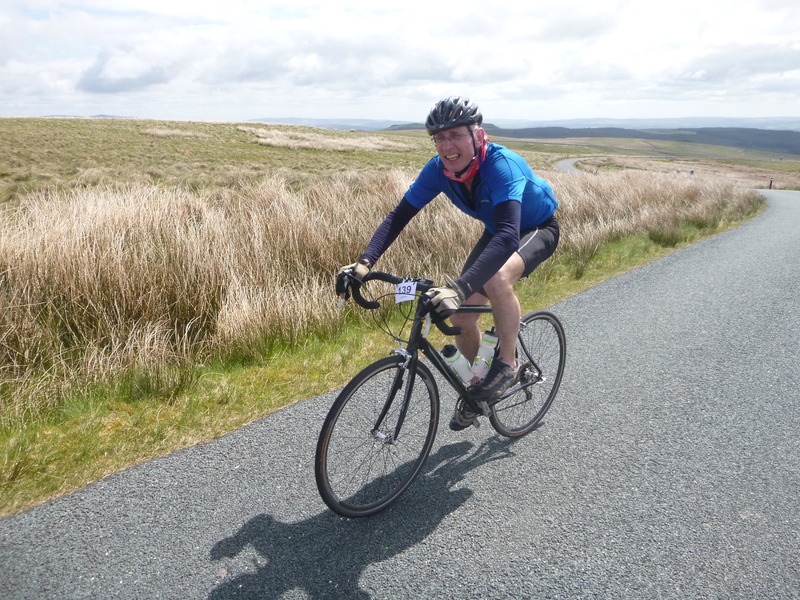 But a couple of weeks ago I learned I’d got a place in this year’s Fred Whitton Challenge. So over the next three months I must teach my body to ride more-or-less non-stop for 112 miles over all the Lakeland passes, the double-whammy of Hardknott and Wrynose Passes coming when I’ll already have 100 hard miles in my legs. 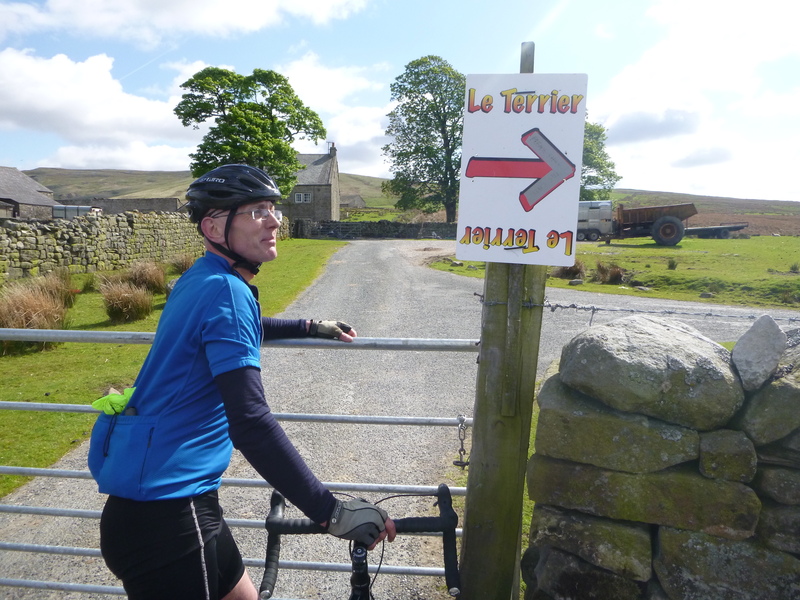 Last week I followed a 78 mile route along which I’d identified four potential cafe stops, at Ingleton (18 miles), Hawes (36 miles), Sedbergh (51 miles) and Kirkby Lonsdale (62 miles). Two months from now I’ll aim to use none of them, but last week I used two; after 36 miles into an icy head-wind I was ready for beans on toast at the Penny Garth Cafe in Hawes, and partly because it’s such a quick and easy stop I sank a mug of tea whilst eating my flapjack outside the caravan-cafe on Devil’s Bridge at Kirkby Lonsdale – both those places have stronger cultural allegiances with motorcycling, but they’re supremely useful and welcoming to the tired and/or hungry cyclist too. Yesterday I almost rode on at Slaidburn, twenty miles in, but with the climb to Bowland Knotts at 422 metres just ahead, I decided instead to be cautious and replenish myself with a mug of coffee and a couple of slices of toast at the Riverbank Tea Rooms. What joy to sit outside in the sunshine, on 3rd February in the north of England! And what privilege to make such places meaningful to both ourselves and cycling by enrolling them into our rides, into our biographies, into the history of cycling itself. A few times recently, and again yesterday, I’ve found myself approaching Wray – about 10 miles east of Lancaster – at lunchtime. 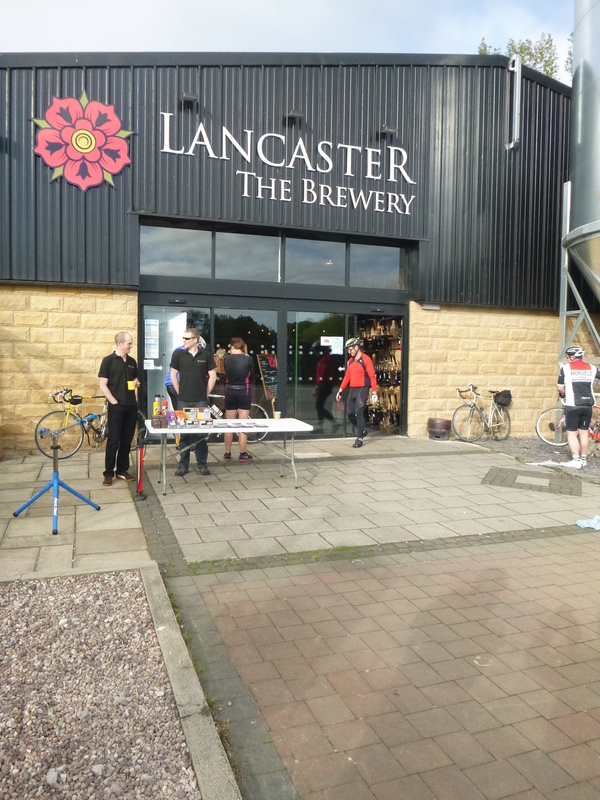 And I seem to have struck a deal with myself – I stop for a quick lunch (the soup is always quick, and delicious) at Bridge House Farm, so long as afterwards I ride back to Lancaster the harder and longer way, on the north side of the River Lune. The cafe is a building block in our cycling lives. We use the cafe in different ways at different times. But cyclists don’t just go to the cafe, cyclists have need for the cafe. The cafe is central to the cycling experience, and for that I think it ought to be praised. Warning, this post is written by a proud Dad – if you’re prone to nausea at parents singing the praises of their kids and/or dwelling in the thrill of parenthood, you might just want to skip it …. I love being a parent. It happened by accident, to be honest. It’s ten years ago now, when we found out Bobby was on his way (Sue had been feeling a bit strange on and off through our fortnight’s cycle-tour of the Pyrenees, and especially on the long ascent of Tourmalet …), and back then I felt completely unable to predict how I would find it. It’s still an open-ended adventure, of course; but wow, on a day-to-day level it’s great, and then – just occasionally – it’s absolutely sublime. And this weekend was absolutely sublime. After our recent holiday in France, Bobby had 300 touring miles in his legs. Out there, he’d also proven himself a very adept rider; he handled his bike well, was able to concentrate for relatively long periods in the saddle, and road calmly and competently when occasionally we encountered busy roads, full of fast-moving motorised traffic. This gave us confidence that he was ready to ride more seriously on our local roads. 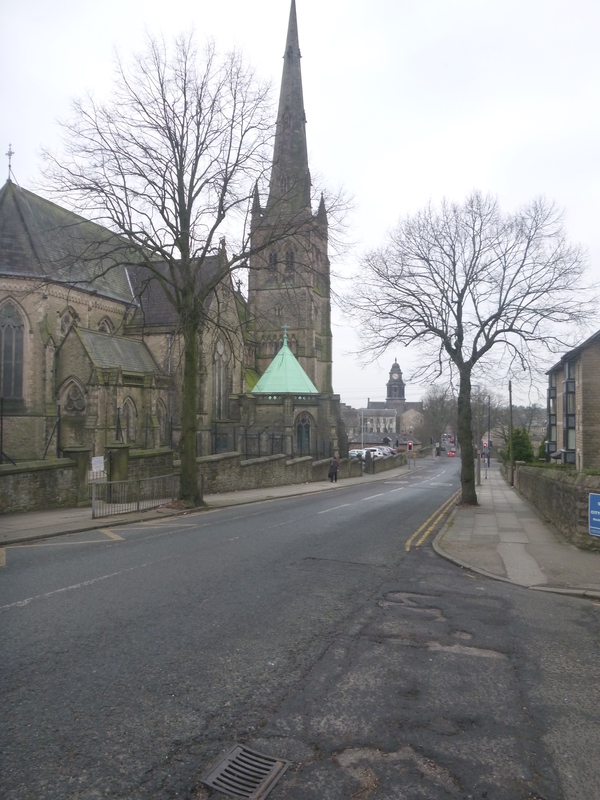 Perhaps our biggest reservation was the severity of the climbs around Lancaster – it’d be impossible to go anywhere Bobby hadn’t already been without tackling some pretty fierce gradients. Although he’d coped with some hills around the Dordogne, they were nowhere near as relentless and steep as those found in our local cycling country. There’s a buzz about watching professional bike riders on your own roads, and we’re lucky in that in recent years the Tour of Britain has passed regularly along ours. The last couple of years it’s come through on a school day, and Sue and I have ridden out without the kids to catch it. But this year it was coming on a Saturday, which meant that Bobby could come along too. We considered how best to turn the experience into a little adventure, and I booked Bobby and myself into Slaidburn youth hostel on Friday night. Straight after school we’d ride the 24 miles out there, through the Trough, have dinner at the super village pub, The Hark to Bounty, stay overnight, then ride back to the Trough to watch the pro peloton ride through on Saturday, before continuing back home over Jubilee Tower. I was a bit apprehensive about how Bobby would cope with the hills, and the absence of child-friendly distractions along the way, but I also figured that even if we had to walk all of the tougher sections, we could still make it before nightfall. You just don’t know until you give things a go, do you? But I know now that I needn’t have worried, and that Bobby is a stronger and more feisty little fella than either Sue or I had ever imagined. But if Bobby excelled at the cycling, his interests and priorities seemed elsewhere. The highlight of his trip was rescuing a frog off the road which runs over the River Wyre at Street. When we got to Slaidburn he wanted to call Mum and list the creatures we’d spotted along the way – not just the frog, but a sparrowhawk, a hare, countless rabbits and a black cat. All along the way he was keeping a list of the things he’d seen. Initially I thought this odd, but when I quizzed him he told me he was relaxed about the cycling, and confident about tackling the climbs, because Sue and I believed that he could do it, so he believed he could do it too. The big deal for Bobby was not the cycling, but the world which cycling was opening up to him. At times I watched him riding in front of me, getting blown by the wind as he made his way across the moors, and it almost blew my head away – the vicarious sense of what he must be experiencing; how he was encountering with all his senses this magnificent world by bike which I tend so often to take for granted. The adventure for Bob was less in the turning of the pedals, than in the world which his pedalling was bringing about. The biggest test of the trip would undoubtedly be the following day, tackling the Trough from the south-east, the hard side. We rode out of Slaidburn on the back road to Newton, a road I’d never taken before and which will forever now be for me ‘Bobby’s road’, and then onto Dunsop Bridge, where we stopped for coffee, hot chocolate and to feed the ducks. Sue and I have ridden past the Dunsop Bridge ducks so many times and said to one another how much Bobby and Flo would enjoy them – often they waddle their ways across the road, or simply sit in it, holding up the cars – so that drivers must emerge and ‘shooo’ them out of their way. And here, finally, was Bobby’s introduction to the Dunsop ducks; we bought a bag of duck food from Puddleducks and out on the village green, and much to his delight, he was quickly surrounded; the pure and simple joys of childhood …. We returned to the steepest section of the climb to watch the riders come through. Friends were among the many people continuing to arrive – first Jules and his daughters Anya and Mia, and then Hayden, Jim and Reuben – and together we shared the very specific and very intense enjoyment which comes from anticipating the peloton about to pass you by. Then, suddenly they were upon us – first a breakaway of three riders, Richie Porte and Wout Poels, with Jack Bauer struggling on the gradient to stay in touch with them. We cheered them on. A few minutes passed and someone shouted that the peloton was at the foot of the climb. I looked down to the valley’s bottom, and there – what a feeling! Then they were upon us, point blank, moving so fast it took our collective breath away. And in an instant they were gone. The event had moved up the road, leaving us behind, with our little moments, tiny fragments of sensations and memories. The bike race had punctured our everyday cycling lives, which are different now, as are the roads on which we will continue to ride. We set off home via Jubilee Tower, another place about which Bobby had heard us talk but to which he had never before been. He wanted to cycle up Jubilee Tower. We approached from the moor side, the easy way. One day soon, now we know what he can do, we’ll tackle it the hard way, from Lancaster. He was chuffed to bits to reach the top of the climb, and then to climb up the Tower itself. Through his cycling he had won views, of the bay and of the hills, which he hadn’t known existed; he could see his home from another perspective. Whatever the conclusion, another chapter in Bobby’s cycling journey has begun. I’m not so sure about Bobby, but Sue and I are thrilled. There are lots of people bunking off work this week, to catch a stage of the Tour of Britain. Tuesday was our turn. 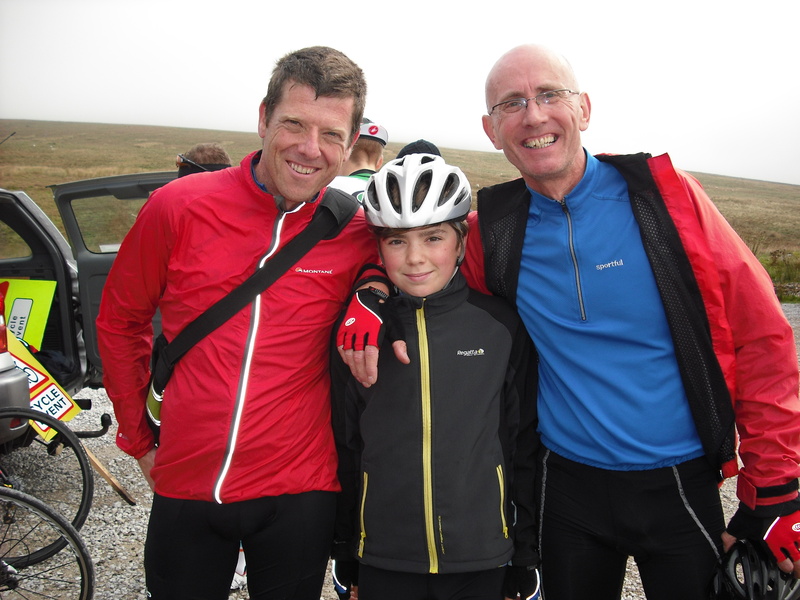 I dropped Bobby and Flo at school, then rode with John Krug up Jubilee Tower and through the Trough of Bowland to Slaidburn, where we started the tough climb up to Cross o’Greet, the spot we’d selected as the best place to watch the pro peloton pass by. 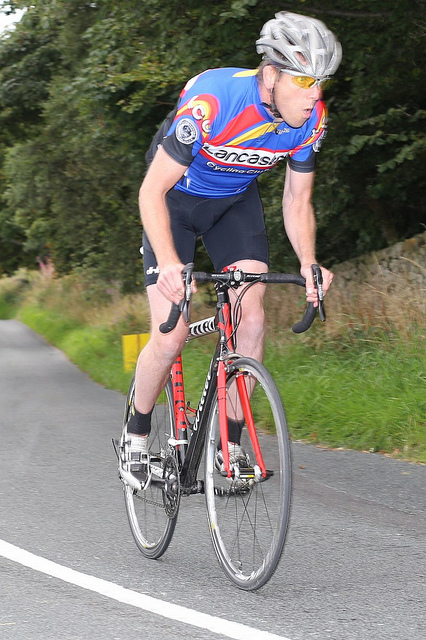 Jim Rose should have been with us, but he’d taken a spill riding along the shore of Coniston at the weekend, and was recovering from an operaton to determine the extent of the damage done to his hand. The news is it’s not too bad. 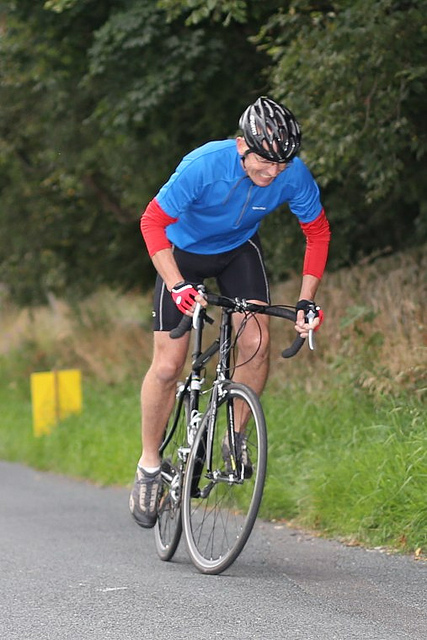 Get well, and back on your bike, soon Jim. John was on a bike he’s recently assembled, based around a Hewitt frame. It looks really beautiful, and seems to ride equally well. We’d only got home from a 60 mile ride around Kingsdale, Dentdale and Barbondale after midnight, so our legs groaned under the climb, but we reached the top ahead of the professionals, and installed ourselves alongside Sue and Tom Bone (not his real surname, but he plays the trombone, so that’s what we call him) who’d left Lancaster half an hour before us. It was a glorious day, blue skies and sun shine, hanging out with other cyclists, and watching the pros come through – Nicholas Roche in a 3 man break, Bradley Wiggins comfortable in the bunch, Rob Hayles struggling (a result of a crash earlier in the race) off the back. Then suddenly over, and hordes of cyclists descending together off the fells – an utterly beautiful sight, and experience. Watching the Tour of Britain pass along your local roads isn’t really about watching the Tour of Britain – it’s an excuse for a ride, a chance to re-affirm your sense of yourself as a bike rider, and to participate in a communal activity. I might say that ‘I’m doing my bit to support the sport’, but I also know that I’m supporting myself as someone who cycles, and continuing the everyday process of becoming who I’d like to be. It gives us a different, less ordinary, reason to get out there and ride. That said, the professionals are magnificent. The speed they rode past us! And knowing they’ve ridden your roads changes your cycling scape. Earlier this year I rode the cobbled climbs of the Tour of Flanders – struggling up the Koppenberg, I could feel the weight of cycling history (after all, every rider who matters in the history of cycle sport has ridden that climb) pushing me up. Spine tingling stuff!